On August 1, 2017, the Department of Water Resources (DWR) via email, confirmed the public availability and provided hyperlinks to the final Biological Opinions from the National Marine Fisheries Service and the U.S. Fish and Wildlife Service, the final 2081(b) Incidental Take Permit from the California Department of Fish and Wildlife, and the certified Final Environmental Impact Report/Environmental Impact Statement and Notice of Determination. They also noted that the U.S. Bureau of Reclamation (Reclamation) continues to contemplate the Record of Decision (ROD) that will accompany the Final Environmental Impact Statement. On August 3, 2017, DWR requested that the hearing officers issue notice for Part 2 of the hearing because a definitive schedule for the issuance of the ROD does not exist and because DWR believes that the substantive information necessary to continue Part 2 is available and any delays may negatively impact the continuity of the evidentiary record. That same day, Save the California Delta Alliance (SCDA) responded to DWR’s request by urging the hearing officers to clarify that the start of Part 2 will not be scheduled until at least 90 days after: (1) completion of all steps of the ESA process; (2) issuance of Reclamation’s ROD and certification of the EIS; and (3) Petitioners submit a complete and current stand-alone project description including all currently known elements of project operating criteria. We received joinders from a number of parties. The hearing officers have instructed staff to direct petitioners to respond to SCDA’s request by noon on Thursday, August 10, 2017. Any other parties who wish to respond to SCDA’s or DWR’s request regarding scheduling of Part 2 of the hearing may also do so by that deadline. Parties who have already submitted responses need not repeat their comments. The parties will have until noon on Friday, August 11, 2017, to submit any replies to the responses that are submitted by the August 10, 2017 deadline. 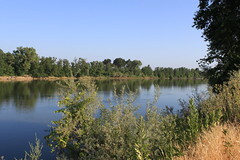 On June 29, 2017, the Sacramento Valley Water Users (SVWU) notified the hearing officers of subpoenas duces tecum issued to Reclamation and DWR seeking production of documents and modeling files referenced in the Biological Opinions issued by the U.S. Fish &Wildlife Service and the National Marine Fisheries Agency on June 26, 2017. SVWU also requested that the hearing team set up a dedicated folder on the WaterFix FTP site for the subpoenaed records. On July 5, 2017, the hearing team notified all parties that the folder had been created to facilitate any production of documents and ensure access for all parties. On July 7, 2017, SVWU notified the hearing team that in advance of the subpoena deadline, SVWU met and conferred with counsel for DWR and Reclamation and reached a mutual agreement to modify the schedule for compliance with the subpoenas. On July 10, 2017, DWR completed partial production of the subpoenaed documents and DWR provided the remaining documents in its possession on July 17, 2017. On August 4, 2017, SVWU notified the hearing officers that the Department of Interior (DOI), who is representing Reclamation in this proceeding, had not objected to or complied with the subpoena, and filed a motion seeking to have the State Water Resources Control Board (State Water Board) compel Reclamation to produce the subpoenaed documents. The hearing officers have instructed State Water Board staff to direct DOI to respond to the SVWU’s motion by 5 pm on Wednesday, August 9, 2017. DOI’s response should address whether Reclamation has any responsive documents in its possession that it has failed to produce. If so, DOI should state whether and when Reclamation intends to produce the documents, and explain the basis for any position that DOI may have taken with respect to Reclamation’s obligation to comply with SVWU’s subpoena. The deadline for SVWU to submit a reply to any response filed by DOI is 5 pm on Friday, August 11, 2017.